John Boehner says that the Republicans are not going to be bullied by Barack Obama and Harry Reid. Here’s a rush transcript for the video above. STEPHANOPOULOS: How is this going to end? You’re clearly not budging right now, even though you are taking — even though polls show that most Americans blame Republicans for the shutdown right now. How long is it going to go on? Is the government going to stay shut down until we reach the debt limit deadline of October 17th? BOEHNER: Listen, the debt limit is right around the corner. The president is saying, I won’t negotiate. I won’t have a conversation. Even though, President Reagan negotiated with Democrats who controlled the Congress back then. Even though President George Herbert Walker Bush had a conversation about raising the debt limit. During the Clinton administration, there were three fights over the debt limit. You and I participated in several of those. And even President Obama himself in 2011, went through a negotiation. Now, he’s saying no. I’m not going to do this. I’m going to tell you what, George. The nation’s credit is at risk because of the administration’s refusal to sit down and have a conversation. BOEHNER: We’re not going to pass a clean debt limit increase. BOEHNER: I told the president, there’s no way we’re going to pass one. The votes are not in the House to pass a clean debt limit. And the president is risking default by not having a conversation with us. STEPHANOPOULOS: So under no circumstances will you pass a clean debt limit? BOEHNER: We’re not going down that path. It is time to deal with America’s problems. How can you raise the debt limit and do nothing about the underlying problem? George, we’ve spent more than what we’ve brought in for 55 of the last 60 years. This year, the federal government will have more revenue than any year in the history of our country, and yet we’re still going to have a nearly $700 billion budget deficit. We’re squandering the future for our kids and our grandkids, by not dealing with this problem. STEPHANOPOULOS: The deficit, as you know, has been coming down this year, but I want to press you on this issue of the risks of not passing a clean debt limit. The Treasury Department put out a report just the other day, where they said it would be unprecedented and catastrophic, that would be the impact of failing to pass a debt limit. They’re going to say, credit markets could freeze. The value of the dollar could plummet. U.S. interest rates could skyrocket. The negative spillovers could reverberate around the world, and there might be a financial crisis and recession that could echo the events of 2008 or worse. Do you agree with that assessment? BOEHNER: I do. And the president is putting the nation at risk by his refusal to sit down and have a conversation. STEPHANOPOULOS: As — we’re going to go back on this. He says you’re putting it at risk by refusing to pass a clean debt limit, so just let me — let me press that, because there have been some reports that you have told your own members that you would be willing to put a debt limit on the floor that would pass with Democratic votes, even if it didn’t get a majority of the Republican caucus. Is that no longer true? BOEHNER: My goal here is not to have the United States default on their debt. 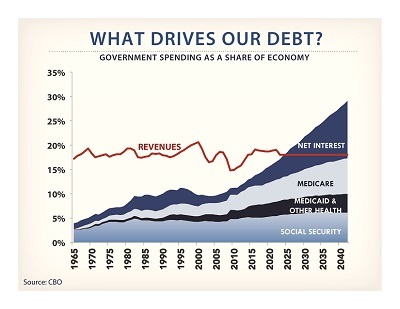 My goal here is to have a serious conversation about those things that are driving the deficit and driving the debt up. And the president’s refusal to sit down and have a conversation about this is putting our nation at risk of default. STEPHANOPOULOS: So are you saying that if he continues to refuse to negotiate, the country is going to default? BOEHNER: That’s the path we’re on. The president canceled his trip to Asia. I assumed — well, maybe he wants to have a conversation. I decided to stay here in Washington this weekend. He knows what my phone number is. All he has to do is call. STEPHANOPOULOS: So it’s October 17th, 8:00 p.m. The clock is ticking towards midnight. The country is scheduled to run out of money, won’t be able to pay its bills anymore. What do you do in that moment? BOEHNER: No family in America can spend more than what it brings in for 55 of the last 60 years. No family or business in America can survive a $700 billion budget deficit in one year. It is time for us to deal with our underlying spending problems. I’m willing to sit down and have a conversation with the president. But his refusal to negotiate is putting our country at risk. STEPHANOPOULOS: So the clock is ticking on October 17th. You’re not going to put that bill on the floor? BOEHNER: I want to deal with our underlying problem. STEPHANOPOULOS: Yes or no, would you put that bill on the floor? BOEHNER: I don’t want the United States to default on its debt. But I’m not going to raise the debt limit without a serious conversation about dealing with problems that are driving the debt up. It would be irresponsible of me to do this. STEPHANOPOULOS: It’s also been reported that you’re going to guarantee that we do not default. It sounds like you’re not prepared to offer that guarantee, you’re not prepared to promise you would actually put the bill on the floor. BOEHNER: I’ve been willing to sit down with the president and have this conversation. His refusal to negotiate is what’s putting the government at risk of default. What is Boehner talking about having a conversation about debt? That’s what Boehner is talking about. He doesn’t want to keep raising the debt ceiling over and over when it looks like the entitlement programs are going to be consuming a greater share of government revenues, leaving no money left over for other programs. It looks like the Republicans in the House are serious about trying to stop our runaway spending problem. The Democrats? They just want a blank check to keep spending on Solyndra, and then they’ll send your kids (and grandkids) the bill. Why did Detroit go bankrupt? Who is to blame? Whose fault was it? This article from Front Page magazine traces the history of the city of Detroit. Beginning in 1962, Detroit has endured a steady diet of Democratic mayors and their social welfare agenda. Beginning in 1962, Mayor Jerome Cavanagh ushered in a “Model City” program to a nine-square-mile section of the city. It was based on a Soviet Union-style approach, aimed at rebuilding entire urban areas all at once. The effort was funded by a commuter tax and a new income tax that Cavanagh told residents would be paid by “the rich.” Yet the same central planning that that formed the heart of the Model City program was extended to the people themselves, who eventually resented being told by government how to run their businesses and their lives in exchange for government goodies. Unsurprisingly, the program was a monumental failure. Then there were the riots. In 1967, police broke up a celebration at a “blind pig.” Blind pigs were after-hours clubs that featured gambling and prostitution and had been part of the traditional black culture in Detroit since Prohibition. The political leadership considered them antithetical to the Model City program. An enraged neighborhood did not. People took to the streets, igniting the worst race riot of the decade. Black-owned business were looted and burned to the ground. Forty people were killed and 5,000 were left homeless. Thus began the “white flight” out of the city center, totaling 140,000 people over an eighteen month period, ensued. The city never recovered. None of this stopped the progressive agenda from continuing to be implemented. Public employees were given precisely the exorbitant wage and benefits packages that are coming back to haunt the city now. This Democrat-fostered attitude extended to private sector unions, whose equally exorbitant packages, along with efficiency-strangling work rules, made the cost of doing business in the Motor City prohibitive. As a result, much of the car industry that formed the city’s employment backbone left for right-to-work states that provided a far less hostile — and far more affordable — business climate. As chronicled here, the same progressive-inspired insanity destroyed the Detroit public school system (DPS), which itself stands on the brink of bankruptcy. This tragedy is highlighted by several sad realities. In 2009, DPS students turned in the lowest scores ever recorded in the national math proficiency test over its then-21-year history. The state of Michigan, led by Detroit, has one of the highest black-white achievement gaps in the nation. As of June 12, only 1.8 percent of the system’s students were capable of doing college level work. Yet by far the most telling indictment of the system is this mind-bending reality: a full 47 percent of city residents are functionally illiterate. The governor of Michigan Rick Snyder has just come out and said that he will not ask for a bailout from the federal government of Detroit. Michigan Gov. Rick Snyder and the bankruptcy specialist he appointed to fix Detroit’s unprecedented financial problems put the blame Sunday squarely on the city and defended their decision to file for Chapter 9. The Republican governor said Detroit created the problems and stood steadfast behind his decision to file Thursday for bankruptcy, with the city roughly $19 billion in debt. He said corruption and city leaders ignoring warning signs for 60 years contributed to the problems. Among his biggest concerns, Snyder said, is the decline of municipal services for Detroit’s remaining 700,000 residents, including police response times of nearly one hour. Thank God. Maybe now they will start to elect Republicans for the first time in over 50 years. Take a look at this article from the leftist Washington Post, which reports on how the socialists in Argentina have imposed price controls in order to minimize the impact of runaway inflation caused by money printing. Argentina announced a two-month price freeze on supermarket products Monday in an effort to stop spiraling inflation. The price freeze applies to every product in all of the nation’s largest supermarkets — a group including Walmart, Carrefour, Coto, Jumbo, Disco and other large chains. The companies’ trade group, representing 70 percent of the Argentine supermarket sector, reached the accord with Commerce Secretary Guillermo Moreno, the government’s news agency Telam reported. […]Economist Soledad Perez Duhalde of the abeceb.com consulting firm predicted on Monday that the price freeze will have only a very short term effect, and noted that similar moves in Argentina had failed to control inflation. Consumers shouldn’t be surprised if the supermarkets are slow to restock their shelves and offer fewer products for sale, she added. Isn’t ironic that the United States is pursuing the exact same policy of printing money and overspending as Argentina has? Excerpt we are a little further along. What consumers will certainly do is scramble into local stores to take advantage of artificially-controlled prices knowing very well they have two short months to stock up on perishable goods at today’s prices, before the country’s inflation comes soaring back, only this time many of the local stores will not be around as their profit margins implode and as owners, especially of foreign-based chains, make the prudent decision to get out of Dodge while the getting’s good and before the next steps, including such measures as nationalization, in the escalation into a full out hyperinflationary collapse, are taken by Argentina’s female ruler. […]So to summarize: first capital controls, then a currency crisis, then expectations of sovereign default, then a rise in military tensions, and finally – price controls, after which all out chaos usually follows. Study this sequence well: it is coming to every “developed” country near you in the months and years ahead. Just to be clear, price controls are a clear signal to suppliers to stop supplying, since they cannot make any money if prices are held low by government decree. Price controls lead to shortages, necessarily. And that’s what’s in store for Argentina once the private sector food suppliers (and other companies) pull out of there when they can’t make a profit. There are other places they need to be. Imagine if America elected a charismatic, incompetent fool to run our country like socialist dictators do in Argentina or Venezuela. Imagine if the mainstream media, with their non-quantitative degrees and lack of real-world experience, covered for his every blunder. Where would we be then? […]As one commenter noted earlier, federal financial aid and student loans have driven up law school tuition and student loan debt: “education loans . . . often have implicit government guarantees,” even those not explicitly backed by the government. As a result, “like the GSE’s, the supply of credit for education loans has continued to expand. So in a way colleges and universities, public and private have been in a bubble akin to the housing bubble. The benefits to the institutions are irresistible and so there is no way they will try to reign in costs and thus tuition. Not as long as students are willing and able to borrow.” When the bubble pops, taxpayers will be on the hook for countless billions of dollars (many graduates already are not repaying their student loans). “Why is college so expensive? A new study points to a disconcerting culprit: financial aid,” notes Paul Kix on page K1 of the March 25 Boston Globe. I and professors and education experts commented earlier on that study at Minding the Campus. Other studies also have concluded that increased federal financial aid, such as student loans, drives up college tuition, and you can find links to some of them here. According to the liberal New York Times, law schools do a woeful job of preparing students to practice law. The lesson today — the ins and outs of closing a deal — seems lifted from Corporate Lawyering 101. […]Consider, for instance, Contracts, a first-year staple. It is one of many that originated in the Langdell era and endures today. In it, students will typically encounter such classics as Hadley v. Baxendale, an 1854 dispute about financial damages caused by the late delivery of a crankshaft to a British miller. Here is what students will rarely encounter in Contracts: actual contracts, the sort that lawyers need to draft and file. Likewise, Criminal Procedure class is normally filled with case studies about common law crimes — like murder and theft — but hardly mentions plea bargaining, even though a vast majority of criminal cases are resolved by that method. Not only that, but the marketplace is saturated with lawyers already. When supply increases and demand decreases, prices fall. The new batch of lawyers are not going to be able to command the same salaries as the old batch. Standard & Poor’s may downgrade the long-term credit rating of the U.S. once again in less than three months after sending shockwaves through the bond and stock markets by stripping the nation of its top notch triple-A rating last week, according to an emergency Sunday night conference call for clients of Bank of America Merrill Lynch. Harris said that the U.S. should have avoided the downgrade in the first place by meeting S&P’s demands of a $4 trillion deficit cut and a “demonstrating a sensible budget process.” What they got instead was a “deficit cut of $2.1 trillion and a budget process that’s been extremely chaotic,” said Harris. In the midst of a world embroiled in economic turmoil, a few nations have managed to do surprisingly well—among them, Estonia. After near economic collapse during the 2008–2009 financial crisis, the country has managed to successfully bounce backwith substantial GDP growth, a vibrant trade environment, and a notable budget surplus. During the first quarter of this year, Estonia had the highest rate of growth in the EU and the biggest drop in unemployment. In July, its credit rating was raised by Fitch to A+, a reflection of substantial economic growth. But how did Estonia get here? Estonia possesses a flexible, open economy and investment climate that encourages competition and economic growth. It remains one of the world’s freest economies, according to The Heritage Foundation’s Index of Economic Freedom. However, prudent fiscal policies have played the largest role in Estonia’s impressive economic performance, particularly in recent years. Still, the path to fiscal conservatism was not easy; it required a lot of rigorous, painful cutback involving 9 percent of GDP in fiscal adjustments and large cuts to nominal wages. Notice that Estonia’s economic policies are tea party conservative policies, not socialist policies. Meanwhile, the White House has yet to respond to our first credit downgrade.